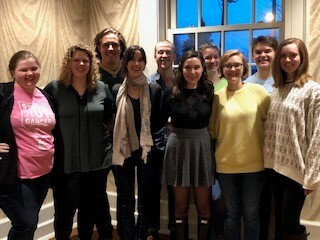 Belmont students in the Department of Theatre and Dance recently presented their work at The Kennedy Center’s 2019 American College Theatre Festival (KCACTF), Region IV in Spartanburg, SC. The region consists of colleges and universities from Tennessee, Kentucky, Alabama, Georgia, Florida, Mississippi, North Carolina, South Carolina and southern Virginia. KCACTF is a national theater program involving 18,000 students from colleges and universities nationwide which has served as a catalyst in improving the quality of college theater in the US. The Festival has grown into a network of more than 600 academic institutions throughout the country, where theater departments and student artists showcase their work and receive outside assessment by respondents. Categories for assessment and evaluation include performance, directing, playwriting, dramaturgy, design technology and management. The Irene Ryan Acting Scholarships is the main performance category at KCACTF, which supports student-actors with recognition, honor and financial assistance to the top outstanding performers across the nation. Belmont students Megan Huggins, Gillian Britt and Taite McKinney performed monologues and scenes as nominees for the Irene Ryan Acting Scholarships. Their acting partners were Rachel Mackall, Erik Hylko and Jacob Gill with Brent Maddox as faculty advisor. Special recognition went to McKinney and Gill who were among the top 40 selected out of the 1800 auditionees to perform in the Semi-Final round at the regional festival. For Design Technology and Management, Sami Hansen presented her work as Stage Manager for These Shining Lives, Jamie Noon presented her Scenic Design for Yankee Tavern, Rylee Hickey presented her Sound Design for Yankee Tavern and Caitlin Barnett presented her Sound Design for Men on Boats. Faculty advisors for the above students were Jessica Mueller, Paul Gatrell and Jackie Jutting.